This time I will eat haggis. I didn’t eat it last time I was in Scotland because of its off-putting reputation. 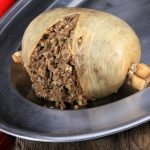 I had long heard haggis referred to disparagingly as some kind of low-class food eaten only by people whose economic circumstances forced them to eat haggis. The joke long had been that if you are going to eat haggis, don’t ask what’s in it. I’ve always considered myself adventuresome when it comes to food, pretty much willing to try just about anything, as a parade of sushi chefs can attest. Only a very few things have put me off. I’ve never eaten rabbit because the idea of eating a rodent just doesn’t feel right. I’ve never had the opportunity to eat blow fish and probably wouldn’t anyway because the idea of eating something that, if not handled correctly, could kill me, is not high on my list. There are things I’ve tried but don’t like and wouldn’t eat again, things like conch, although I love escargot. I’m not high on king crab legs, but I love Dungeness crab, soft shell crab, blue crab, or hairy crab. That’s what has guided me through nearly eight decades of dining. It’s what led me to try and enjoy the likes of black pudding in England and blood sausage in Argentinian restaurants. Wherever Jennifer and I have traveled, I’ve pretty much been willing to at least try whatever the local custom suggested. But for some reason I took a pass on the national dish of Scotland. That is about to end. I’m leaving June 18 for a golf trip to Scotland with friends Mike, Bob and Scott and while there, I will eat haggis. Okay. So there’s nothing in haggis that I haven’t eaten before in other preparations. I love calves heart and chicken heart. I love calves liver and chicken liver. I don’t pursue lungs as part of my regular diet, but I’ve eaten them and would again. As for casings, given my love of sausages and my enjoyment of the Jewish concoction known as kishka, there probably aren’t many casings I haven’t already eaten. More from Wikipedia: “It is believed that food similar to haggis (though not so named), perishable offal quickly cooked inside an animal’s stomach, all conveniently available after a hunt, was eaten from ancient times. Although the name ‘hagws’ or ‘hagese’ was first recorded in England c. 1430, the dish is considered traditionally of Scottish origin. It is even the national dish, as a result of Scots poet Robert Burns’ poem Address to a Haggis of 1787. Haggis is traditionally served with ‘neeps and tatties’, boiled and mashed separately, and a dram (a glass of Scotch whisky), especially as the main course of a Burns Supper.” Neeps and tatties are turnips and potatoes. As I worked with our tour planner to select restaurants for this trip, I checked many website menus in Inverness, St. Andrews, and Edinburgh, the three cities where our golf journey will be anchored. I found once-scorned, once-belittled, once-put upon haggis now appearing as a starter, or appetizer on virtually every fine dining menu I explored. That was not the reason for my decision to try haggis this trip. I already had thought I was silly to pass it up last time. But seeing it having evolved to this level certainly didn’t weaken my resolve. And besides, it’s made with oatmeal as a binder and that’s the secret to Jennifer’s recipe for her best-in-the-world meatloaf. Then, when the ball stops 2 inches short of the hole, or hangs on the right lip, we tap it in and move on to the next 40-footer, certain this time we will hear the sweet music of the ball rattling in the cup as we walk after it. Then there’s the group ahead of us, with the guy who lies 230 yards from the green after a 180-yard drive and he’s waiting for the green to clear. He’s an optimist who remembers the time he hit the green from 230 out when he was still in his 40s. There should be a sign at the entrance of every golf course in the world – ONLY OPTIMISTS MAY ENTER. It’s become easy to have the same attitude about dining in Scotland. As I’ve written during earlier trips, the bad rap on food in the United Kingdom is out of date. Several years ago, Jennifer and I did a five-week driving vacation through England, Scotland and Wales. We dined like royalty. We spent a week at the Shetland and Orkney Islands and ate very well. Four years ago, at Cornwall, we discovered some outstanding restaurants and last year’s jaunt to the Lake District was beyond rewarding. In the coming nine days, four of us will be dining at a mixture of fine restaurants and pubs as we tee ‘em up for eight rounds on seven different course and follow each round with dinner and a rehash the day’s action. The cast of characters includes Mike, his very adult son Scott, Bob, and me, members all of the Sepulveda Seniors’ Golf Club centered in the San Fernando Valley portion of the City of Los Angeles. Our adventure has been crafted by Julie, Tara and the rest of the gang at the UK golf travel firm of Havershim & Baker of Cincinnati, Ohio, which put together my Ireland golf trip a few years ago. Tara and I worked together to develop the restaurant portion of the itinerary, with the advise and consent of the other three guys. I came ahead of the other three because I wanted to see Jennifer off as she journeyed to the Channel Islands of Jersey and Guernsey, wisely opting to “not spend eight days in a van and at dinner with four golfers.” I also wanted to have time to get over any jet lag before teeing up at the difficult Championship Course at Royal Dornoch for our first round Friday morning. I had dinner the first night at the restaurant at the Hilton Hotel at London Heathrow Airport. Imagine my surprise, and delight, at finding seared foie gras on the list of starters. For my main, I ordered the 6-ounce fillet. That’s pronounced fill-it in the UK, with the emphasis on the second syllable and translates to fillet (fill-ay) mignon in American English, with the emphasis on the first syllable. It’s something I order only on very rare occasions. Last night’s was medium rare. I cannot explain why I opted for this cut when there was rib eye on the menu, except this was six ounces and the rib eye was 10 ounces. Fortunately, it was very tasty, tender and juicy. It came with a small portion of chips, which translates into French fries in American English. Only these were more like wedge-cut potatoes, with a taste and texture more like roasted than deep fried. For a hotel meal, it was way above average, but no match for my second solo meal, dinner at the Kingsmills Hotel in Inverness, Scotland. Whoda ever thought you could liquify langoustines? It was chilly and the idea of something soupy sounded appealing. It’s on the menu as Langoustine Bisque with tortellini. I expected to find pieces of langoustines in the bisque. Nope. It was a creamy bisque with liquified langoustines and a complimenting hint of fennel that was heaven. The langoustine flavor was pronounced and brought visions of sandy beaches and the salty hint of ocean. The Argentinean Malbec was a perfect match. For a main, I selected monkfish tails, only to be told they were not available. So, I switched to a duo of lamb rump and lamb chop. Very, very good. In browsing through the online menus to select restaurants for this tip I noticed certain items seem to appear on all of them – sea trout, cod fish, venison, rib eye steak, and the aforementioned fillet. There were differing flourishes in the descriptions of how the dish is served, but the basics appeared the same almost everywhere. In the spirit of this feature, however, we will be optimistic about the dining and not concerned about those menus. There will be good dishes and other dishes. There will be good restaurants and pubs and there will be others. We are going to play golf at courses on which the history of the game is written, courses older than the United States, some dating back to before the Pilgrims made their pilgrimage to Plymouth Rock. That’s what is important. We didn’t come here to dine. We will play the Old Course in St. Andrews, where Old Tom Morris himself shaped and carved the land into what is the most famous golf layout in the world. For you Americans, St. Andrews is the name of the city. Old Course is one of six golf courses in the city. We’ll walk fairways that have known the footsteps of Arnie, Jack, Tiger and every other great professional golfer and many of the finest armatures who ever have played the game. There can be nothing negative in that, whatever our scores. If the golf is as golf often is, we will have good holes and other holes. We will have good rounds and other rounds. It’s Scotland, so we’ll probably get rained on and the wind will blow. We will make memories to take with us the rest of our lives and in a month we probably will have forgotten what we ate or where, unless we look back at the features I post. I received two emails from friends this morning that could create a dilemma. One told me he doesn’t play golf and as this is a food magazine he would appreciate more coverage of the food and less of the golf. The other was from a golfer who said this would be his dream trip and would I mind doing more about the golf and less about the food. Today’s posting will attempt to balance these two opposing requests. First, the most important news. I now have eaten haggis three times. At dinner last night, I had what was listed on the menu as haggis bon bons. They were large size marbles of haggis, lightly breaded and deep fried. The predominant taste was liver. I gave in an okay and decided I needed to give it a try prepared in other ways. Scott, the producer of non-fiction and documentaries for cable TV, said he tried the haggis at the breakfast buffet at our hotel and though it was pretty good. So, this morning I gave it a shot and agree; it was far better than what I had the night before. For dinner tonight – Saturday – we went to Castle Tavern, a pub in Inverness, Scotland. I ordered the haggis with neeps and tatties for a starter. Neeps and tatties are mashed turnips and potatoes. It came covered with and sitting in creamy Drambuie sauce, the haggis sitting on top of the neeps and tatties. Loved it. Bob, the retired LAPD captain in our group, tried some and liked it enough to share some more of it. Now that I have fulfilled the haggis mission, I feel free to let my taste buds roam. I may eat haggis again, or maybe not, just as I may or may not order a shrimp cocktail. But at least I can never again say I passed on the haggis. Now for the golf. Our first round was at Royal Dornoch, abut an hour drive from where we are staying in Inverness. The Scottish countryside was beautiful, but we all were disappointed in the golf experience to varying degrees. There was no driving range at which to warm up, just some nets into which we could hit balls. The putting and chipping green was good. I really disliked the putting greens on the course. I expected to find nice, quick greens on a course so highly touted. Instead, I found the greens to be dishonestly slow, to the point of being off-putting. The caddies were adequate course guides, but no very personable. We had the expected winds and no rain. Part of my problem may have stemmed from having twisted my back getting out of the van. I played the round with some level of pain and I did not play at all well. Today was a whole lot different. The Castle Stuart course 15 minutes from our hotel is one of the beautiful I’ve ever seen, probably ranking right below Pebble Beach in California and Old Head in Ireland. The fairways were in excellent condition and the greens were tough but fair. After much stretching and more Advil that what is recommended on the bottle, I was able to play pain-free. And our four caddies were wonderful. We laughed a lot with them and chatted about family and life as we walked along commenting often about the views that greeted us. I hope this report satisfies the needs of each of my email friends, although the golfer probably wishes the subject matter were in reverse order, but he’ll need to remember this is a food magazine. Tomorrow, we’re off to St. Andrews, where we’ll stay at the famous Old Course Hotel before striking out Monday morning for the actual Old Course, where modern-day golf was invented in its earliest iterations. I had to inhale deeply and let the breath out slowly to steady my heart rate before I moved to stand over the putt. To a golfer, the was hallowed ground, a place where every great professional golfer and hundreds of thousands of amateurs from every corner of the planet had stood before me, a place at which golf has been played since 1552 and derived from an earlier version of the game played on this same ground here at the oldest and most iconic golf course in the world. The temperature was a southern California 77 degrees with only a slight breeze, just enough to keep it from feeling hot. I joked with my traveling companions and our caddies that we must have made a wrong turn on the drive in and missed Scotland. At breakfast the next morning, I asked Bob, Scot and Mike how they would describe the experience of playing The Old Course to a non-golfer who reads an online food magazine. Bob told of a time when he was in a restaurant in Mexico and met Rick Bayless, the famous red haired chef and Mexican food restaurant owner, and how Bayless, after speaking for a while, invited Bob to visit him at his restaurant in Chicago. Bob, who is an avid cook, is originally from Chicago and when he and his wife visited Chicago soon after, he stopped in at Bayless’ Fonda Frontera on a night when Bayless was there and greeted him like a long-lost friend. Bob wound up spending time with Bayless in the kitchen and describes the experience as surreal. Yes, we agreed, that would was special, but Bob didn’t hesitate to agree The Old Course experience transcended that. Think of being invited to dinner at Julia Child’s home. Think of being asked to join Jacques Pepin in his kitchen to prepare a meal. Think of an all-expense paid 30-day trip to the finest restaurants in the nation, or the world. Would that compare? Not unless one of those restaurants was in continuous operation for 466 years and every great chef in the history of the world had cooked there. The difference, of course, is the restaurant is imaginary, but I actually stood over a 5-foot putt for part on the first hole at The Old Course. After prolonged discussion and thinking about it all day, I decided a non-golfer could never understand what yesterday meant because there just is nothing to compare with golf. It is the most difficult physical activity I’ve ever attempted. I’ve been playing for nearly 58 years and never have mastered it. Nearly six decades after striking my first ball and after playing thousands of holes on scores of courses in the U.S., England, Ireland, and Scotland, I still take lessons trying to get it right. And I am not alone in these things. There greatest of professional golfers who ever swung a club will tell you they never perfected the game. Jack Nicholas, one of the greatest of all time, says golf is a game of how good are your misses. Yet we keep playing for the inner challenge of it and the fulfillment that comes from the periodic success. There’s satisfaction in mastering the game even for one perfect shot. I can think of nothing in kitchen or restaurant to match that, and believe me, I’ve tried. I’ve cooked more meals than I’ve played holes of golf. Many were wonderful dinners for friends and family. Some better than wonderful. A few were misses. But even the best of the ones I’ve cooked or the most memorable meals I’ve eaten in restaurants around the globe can match the feeling of standing over a five-foot putt on the number one green at The Old Course the first time you play golf there, with The Old Course Hotel to your left, the Royal & Ancient Golf headquarters building behind you, the North Sea to the right. Breathe. I ordered a burger, rare please. It’s the only way I truly enjoy a burger. Many places will cook it “pink” or medium rare, even if you ask for it rare. Burgers at most coffee shops are too thin to be cooked rare, or even medium rare. They cook through before the fry cook has a chance to flip them. Before Barney’s Gourmet Burgers fled the Fashion Square Mall across from my office in Sherman Oaks, CA, I would treat myself to a rare burger twice a month, and they came perfectly rare. But this wasn’t Barney’s. It was a restaurant at a golf course in Scotland. The waiter took the order for a rare burger. Within a few minutes the manager appeared to explain it is illegal to cook a burger less than medium in the United Kingdom. So I switched my order to a BLT and sure enough the bacon was cooked rare, not crispy. My friend Dan ordered a burger medium rare in a restaurant in Niagara-on-the Lake in Ontario, Canada a few years back, when we were there for the annual Shaw Festival. Nope, he was told, had to be medium or beyond. Last year, at the Empress Hotel in Vancouver, British Columbia, I order a rare burger and got the same story. I asked why and was told it was because of concerns about bacteria-caused illness. So, I switched to order a rare flat iron steak. It was served exactly how I wanted it. I asked the waiter, “Now, bring me a meat grinder and a bun and I’ll make my own rare burger.” He went into a long explanation of the dangers of rare burgers. At dinner, after Dan was turned down for that rare burger at lunch, the menu included steak tartare. I love steak tartare – raw ground beef with herbs and spices best served with a raw egg yolk on the top. I’ve loved it since I first tried it at the late, great Brown Derby in Hollywood in the 1950s. I suggested that Dan order it that night and ask the kitchen to cook it a bit to medium rare and bring it to him with a bun and some slices of tomato and onion. Many times, I have heard people blame California for the business about banning burgers cooked rare or medium rare. People love to blame California and, in fact, such a law once was proposed there. But it failed and you can get burgers cooked any way you want in the Golden State. A few other states have enacted bans – North Carolina, South Carolina, Wyoming – but not California. Several years ago, health officials in England considered changing the law to allow restaurants to serve burgers cooked less than medium, but continue the ban for home-cooked burgers. Owners and chefs at high-end restaurants maintained the meat tasted better when cooked less. Enforcement of the ban in homes would have been an interesting prospect. But the whole thing died and the ban continues. Admittedly, there have been cases of illness and death resulting from eating rare or medium rare burgers. But the issue is the quality of meat and how it’s handled. The frozen patties you find in the store don’t inspire confidence, but they are inexpensive and available to those who can’t afford something better, or who don’t know any better. These patties are made up of meat and other parts of the cattle that are ground together in massive amounts. A single patty may include parts of hundreds of cattle from miles and miles apart. But the burgers you are going to get in higher end restaurants, or the meat used in steak tartare probably was ground on site that same day by kitchen staff trained to keep the meat at safe temperatures. That doesn’t mean it never is mishandled, just that the odds are greatly against it. The requirement that a burger be cooked medium or more probably is an over-reaction put in place to protect consumers against shoddy product. In so doing, law makers have protected me and others against eating perfectly safe burgers at hotels like The Empress in Vancouver. Back to Scotland for a few more words. Scot ordered a rib eye steak medium rare one night. It came medium well. He decided he would give up on meat for the rest of the trip. At dinner that night in St. Andrews, I had an idea: let’s order the steak rare and see what happens. It worked, the steaks came served medium rare. Scott’s no-meat policy backfired later in the trip when he got food poisoning from fish and chips he ordered after golf in North Berwick. Consider these: we eat raw oysters and clams, with no assurance of how they have been handled and with far less regulatory oversight than what applies to beef; some people eat raw fish at sketchy sushi bars that offer all-you-can-eat; restaurants will serve salmon that is cooked so little that the center is almost sushi-like; we eat raw egg on top of raw beef when we order steak tartare and we use raw egg in making a top-grade Cesar salad dressing. We can do these things in restaurants next door to places that can’t serve a medium rare burger. Several years ago, health department regulators in Los Angeles tried to ban Peking Duck, the kind that hangs in the windows of Chinese restaurants and markets. They back down when the local Chinese community rose up to defend a culturally important dish. How about this: give me a legal waiver in which I promise not to sue if I get sick and then go ahead a cook the burger the way I like it.